Sunday’s Telenet Superprestige Ruddervoorde was in a tough spot, venue-wise. The race was sandwiched between the iconic De Kuil of Zonhoven and dunes of Koksijde on one side and the famed Flanders hill of Koppenberg Cross this coming Wednesday. 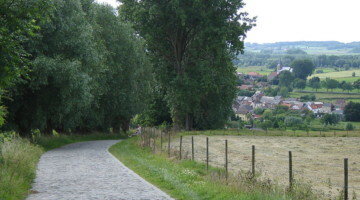 However, the course at Ruddervoorde does feature a sand pit, and the feature was determined to make its mark on the day’s racing. Although set in Belgium south of Bruges, the story heading into Sunday’s race, as it has been since the European riders returned home from the U.S., was the Dutch dominance by Maud Kaptheijns (Crelan-Charles) and Mathieu van der Poel (Beobank-Corendon). 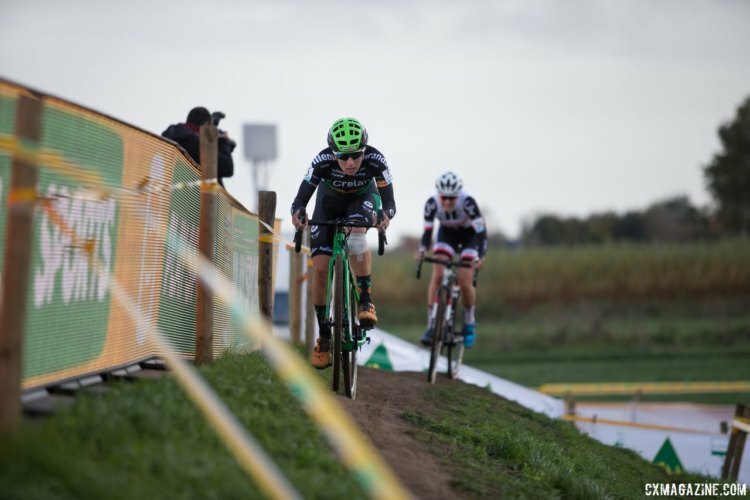 Kaptheijns has burst to the forefront of the cyclocross peloton during the last month, winning the first three Superprestige races and taking the win at World Cup Koksijde as well. For the men, Mathieu van der Poel has been Mathieu van der Poel. The Dutch wunderkind had won 14 of the 17 races he has entered since the 2017 World Championships in Bieles entering Sunday’s race. The two sought to continue aiming their rudders toward victory on Sunday in Ruddervoorde. Sanne Cant (Beobank-Corendon) has made a name for herself as one of the cyclocross stars of the sand with four straight wins at Zonhoven, multiple World Cup Koksijde wins and a thrilling win in the sand at Zeven last year. 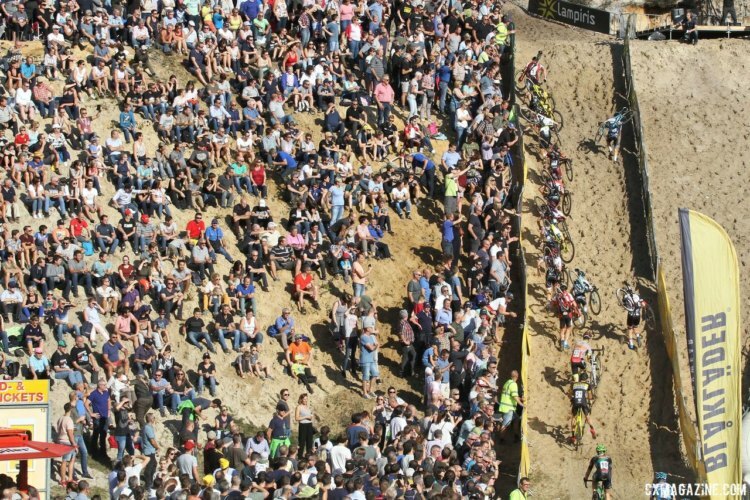 Needless to say, it was a bit eye-opening when Kaptheijns outdueled Cant in the sand sections at the end of last week’s Superprestige in Boom. As Sunday’s tight racing between Cant, Kaptheijns, Lucinda Brand (Team Sunweb), Annemarie Worst (ERA-Cirus) and Ellen Van Loy (Telenet Fidea Lions) moved into the latter stages, it became apparent the long sand pit that riders descended into before climbing out may play an important role in the day’s outcome. Cant, Brand and Kaptheijns crossed the line heading into the bell lap together. During the previous lap, Cant and Brand opened up a gap on Kaptheijns, but the young Dutch star was able to close to the other two riders by riding the length of the sand pit. At the start of the bell lap, Cant and Brand again looked poised to leave Kaptheijns behind. 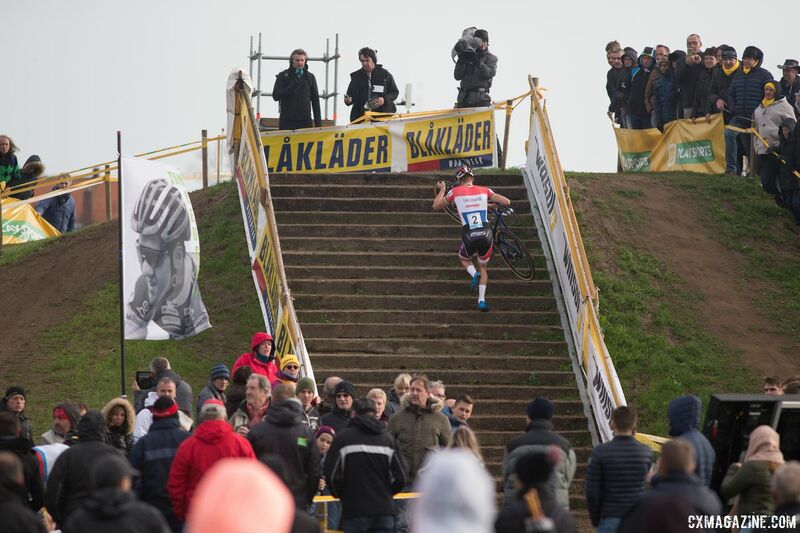 However, the young rider was not going to have her Superprestige streak broken easily. She closed the small gap and then put in an attack of her own to put pressure on the other two riders. Despite the move, it was still wheel-to-wheel racing. As the last lap wound down, the sand pit loomed large. Kaptheijns had been riding it, while Cant was forced to dismount on several of the laps. Getting to the feature first certainly played to Cant’s favor. The defending World Champion knew that and got there first with a well-timed dig around Kaptheijns. Would there be the latest stroke of sand magic from Cant? If it were to happen, it would have to be with more utility than artistic flair on this afternoon. Cant dismounted on the sandy climb and was forced to run to the exit. Kaptheijns, on the other hand, calmly kept her traction and rode the feature behind the running Cant. Since Cant was the first into the sand, Kaptheijns ability to ride the feature did not get her into first. However, at the exit, Kaptheijns accelerated while Cant remounted, and she seized the lead at the next corner. It was now advantage, Kaptheijns. Kaptheijns entered the last corner first and exploded out onto the pavement into the finishing sprint. Cant did not really have a chance. After conceding the sprint and victory to Kaptheijns, Cant was then nipped at the line by Brand. With her late race savvy and sand skills, Kaptheijns stayed perfect in the Superprestige series. The Men’s race at Ruddervoorde featured none of the high drama of the Women’s finale. After Quinten Hermans (Telenet Fidea Lions) led much of the first lap, Mathieu van der Poel (Beobank-Corendon) decided it would be one of the days he sets the pace early on. 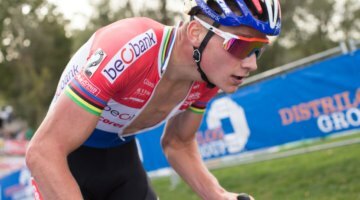 Van der Poel pulled to the front before the first trip through the sand pit and showed off his sand savvy through the section. His reward was a six-second gap after the first lap. Van der Poel’s attack continued into Lap 2, and as often happens, only Wout van Aert (Crelan-Charles) was able to take up the pursuit. And, as often happens, he was unable to match his Dutch rival’s blistering move. His consolation was a solo second position. By the midway point of the race, Van Aert trailed Van der Poel by 15 seconds, while the defending World Champion had a comfortable 25 seconds back to third. Once the attack was through, Van der Poel and Van Aert should be commended for their consistency on a course that became increasingly slick after rain began to fall midway through the 10-lap affair. The gap between the two hovered between 10 and 15 seconds beginning with Lap 4 and continuing all the way through Van der Poel’s celebratory post-up. The win ran Van der Poel’s total to 15 of 18 since the 2017 Worlds. Van Aert again took second. Behind the two wunderkinds, Lars van der Haar (Telenet Fidea Lions) set out to continue riding his hot streak. Van der Haar broke into a solo third, but eventually found himself with teammate Toon Aerts. The two rode together before Van der Haar escaped in the last lap to take the third podium spot. 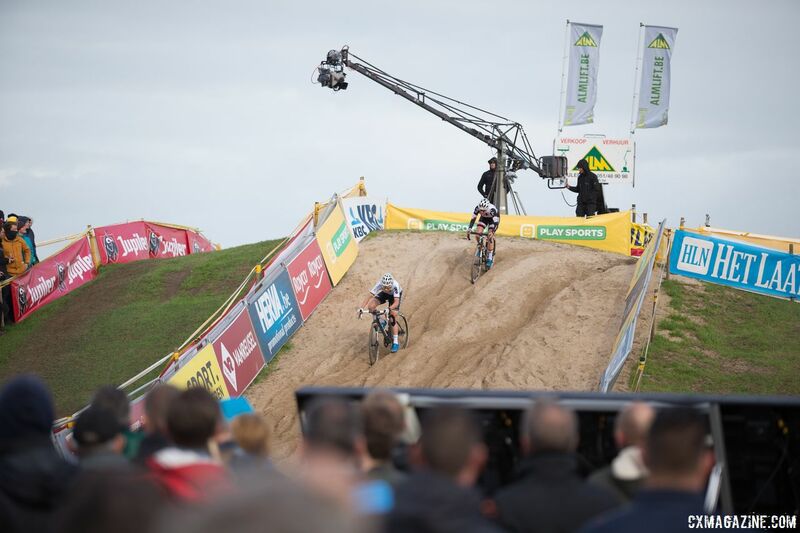 Europe’s best next head to Koppenbergcross on Wednesday for the iconic hillside race. Stay tuned to Cyclocross Magazine for coverage of the racing.